Chief Justice Ranjan Gogoi on Wednesday assured that he shall consider the setting up of a constitution bench to deliberate on the interpretation of section 24 of the Right to Fair Compensation and Transparency in Land Acquisition, Rehabilitation and Resettlement Act of 2013. Solicitor General Tushar Mehta had sought an early hearing on the issue, citing the pendency of numerous connected private litigations. On March 6 last year, a five-judge bench headed by the then-Chief Justice Dipak Misra had directed the counsels to file propositions of law and scheduled the case for hearing after the conclusion of the hearing in all matters, including the Aadhaar challenge which was then underway, that had been referred to the Constitution bench. The bench also clarified that the Constitution bench shall consider all aspects including the correctness of the 2014 decision in Pune Municipal Corporation [(2014) 3 SCC 183] and the recent judgment in Indore Development Authority. The bench also took note of the Yogesh Neema v. State of MP [(2016) 6 SCC 387], wherein the ration in Balaji [(2015) 3 SCC 353] on whether the period during which the award had been remained stayed should be excluded for the purposes of consideration of the provisions of section 24(2) of the 2013 act was referred to a larger bench. Further, notice was taken of the order dated December 7, 2017 in Indore Development Authority v. Shailendra, wherein the question that whether by virtue of the provisions contained in section 24 of the Right to Fair Compensation and Transparency in Land Acquisition, Rehabilitation and Resettlement Act, 2013 the proceedings lapsed on non deposit of compensation in the Court was sought to be referred to a larger bench. The bench also took note of the judgment in UOI v. Shivraj [(2014) 6 SCC 564]. The issue is interpretation of Section 24 of the Right To Fair Compensation And Transparency In Land Acquisition, Rehabilitation and Resettlement Act, 2013. In 2014, a three-Judge bench interpreted this provision in Pune Municipal Corporation v Harakchand Misirimal Solanki, to mean that acquisition proceedings initiated under the 1894 Act five years prior to the coming into force of the 2013 Act would lapse if the acquired land was not taken possession of by the State, or compensation was not paid to the displaced farmers. This bench was presided by Justice R.M.Lodha, who has since retired, and comprised of Justices Madan B.Lokur and Kurian Joseph. The bench held in this case that if the landholder refuses to receive the compensation, then it should be deposited with a court, rather than in the Government treasury if the proceedings were not to lapse. The Arun Mishra-Adarsh Kumar Goel-Mohan M.Shantanagoudar bench, on February 8, in Indore Development Authority v Shailendra (D) Through LRS & Ors, held that this ruling in Pune Municipal Corporation because it held that the landholder, cannot take advantage of his own wrong, by refusing to take the compensation under the old Act, in order to make it lapse, so that he could get the benefit of higher compensation under the 2013 Act. The word 'paid' in section 24 of the Act of 2013 has the same meaning as 'tender of payment' in section 31(1) of the Act of 1894. They carry the same meaning and the expression 'deposited' in section 31(2) is not included in the expressions 'paid' in section 24 of the Act of 2013 or in 'tender of payment' used in section 31(1) of the Act of 1894. The words 'paid'/tender' and 'deposited' are different expressions and carry different meanings within their fold. In section 24(2) of the Act of 2013 in the expression 'paid,' it is not necessary that the amount should be deposited in court as provided in section 31(2) of the Act of 1894. Non-deposit of compensation in court under section 31(2) of the Act of 1894 does not result in a lapse of acquisition under section 24(2) of the Act of 2013. Due to the failure of deposit in court, the only consequence at the most in appropriate cases may be of a higher rate of interest on compensation as envisaged under section 34 of the Act of 1894 and not lapse of acquisition. Once the amount of compensation has been unconditionally tendered and it is refused, that would amount to payment and the obligation under section 31(1) stands discharged and that amounts to payment and the obligation under section 31(1) stands discharged and that amounts to discharge of obligation of payment under section 24(2) of the Act 195 of 2013 also and it is not open to the person who has refused to accept compensation, to urge that since it has not been deposited in court, acquisition has lapsed. Claimants/landowners after refusal, cannot take advantage of their own wrong and seek protection under the provisions of section 24(2). The question which this raised was whether a three-Judge bench was competent to declare the law laid down by another three-Judge bench per incuriam, without consideration by a larger bench. One three-Judge bench presided by Justice Madan B Lokur, stayed the hearing of compensation matters in the land acquisition cases in all the high courts and in the Court itself till it heard the parties on the of reference to a larger bench on the issue on March 7. 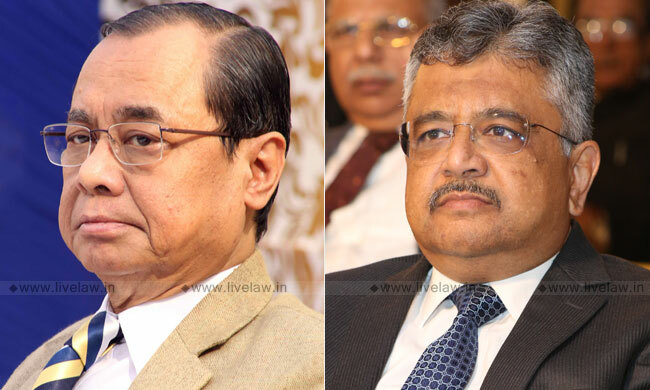 However, two two-Judge benches, one presided by Justice Arun Mishra and another by Justice Adarsh Kumar Goel, pre-empted it, by making a reference to the CJI for constituting a larger bench, to consider the same issue. Senior Counsel Mukul Rohatgi submitted, "The judgment in Pune Municipal Corporation was rendered by a three judge bench, based on which the judgment in Shivraj was delivered. Subsequently, as many as over 200 orders/judgments have been pronounced on the same lines. Then there is the singular case of Indore Development wherein, on February 8, two members of a three judge bench said that the entire line of Pune Municipal Corporation is per incuriam and one disagreed. 'Per incuriam' means negligence". "Further, The February 8 order listed for hearing all pending cases on February 16...Over 5,000 previously decided cases have been opened to review before the High Courts...on February 16, 19 and 20, as many as 100 cases were decided in about one-two minutes hearing", he continued. "On February 21, before a bench headed by Justice Madan B. Lokur, while the state cited the Indore judgment, I intervened and argued on points of reference. The matter was adjourned to tomorrow i.e. March 7", advanced Mr. Rohatgi. "Subsequently, on February 22, two benches headed by Justices Arun Misra and Adarsh Kumar Goel respectively placed the issue before the Chief Justice and thereupon the reference was made to this Constitution bench", he continued. Mr. Mehta, mentioning the question of 'per incuriam' and obiter dicta, submitted, "A coordinate bench could not have stayed the order of another three judge bench, but in the interim, the stay may be allowed to continue". At this point, Justice A. K. Sikri remarked, "This principle would also apply on the question of (the judgment in Pune Municipal Corporation being regarded as) 'per incuriam'. It is prima facie wrong of a coordinate bench". "Of all the cases decided against us on February 16 and 19, over 100 cases had a delay of 2 years... status quo must be maintained in respect of these cases...what if possession is taken...If a judgment is given in ignorance of a statute, even a larger bench may be said to be wrong...", Mr. Rohatgi sought to submit. "There were only 50 cases...some cases were said to be covered by the decision and were accordingly decided and some were adjourned...besides, of the 5 issues decided in Indore Development, certain issues like those of laches and computation of period were not even discussed in Pune Municipal Corporation", submitted the ASG. During the course of the hearing, there was also a mention of the judgment in State of Uttar Pradesh v. Synthetics and Chemicals Ltd., [(1991) 4 SCC 139] on the concept of 'per incuriam'.